Eltronicschool. 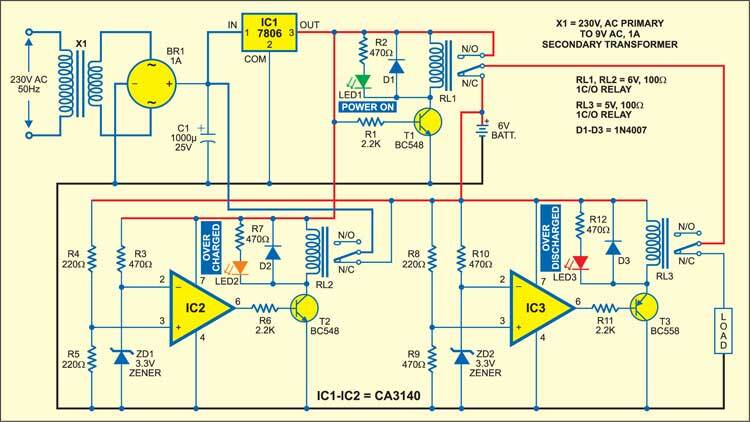 - This is one circuit schematic for you who want to build DC changeover system in this time. Now, you can use the circuit schematic of DC Changeover System with Battery Protection Unit using CA3140 look like shown in Figure 1 below. Circuit schematic like in Figure 1 above is DC Changeover System with Battery Protection Unit using CA3140. Electronicsforu site describe that tthe AC mains is stepped down by transformer X1 (230V AC primary to 9V AC, 1A secondary), rectified by bridge rectifier BR1, filtered by capacitor C1 and regulated by IC 7806 (IC1) to get regulated 6V DC power supply. The changeover circuit is built around IC1. When AC mains is available, npn transistor T1 (BC548) conducts to energise relay RL1 (6V, 100-ohm) and green LED1 glows to indicate the presence of AC mains. At the same time, the regulator’s output feeds the load through the normally-opened (N/O) contact of relay RL1 and the normally-closed (N/C) contact of relay RL3. When the battery is charging, power LED1 glows. When AC mains fails, transistor T1 cuts off and relay RL1 de-energises. As a result, the load is now powered by the 6V battery through the N/C contact of relay RL1. Green LED1 stops glowing to indicate that AC mains is not present, and the load works off the battery. And now you can read more about the DC Changeover System with Battery Protection Unit using CA3140 circuit schematic from original source using link HERE.